Vote for Tucker as the Best in Action – Round Two! Thanks to your votes, Tucker made it to the second round of X Games’ Best in Action online ranking! In this round, he’s up against snowboarder Mark McMorris. You can vote for Tucker everyday on ALL your web devices (computer, mobile phone and iPad, etc.) You have today through Thursday, March 28 to push Tucker to round three! Fresh off of capturing his seventh National Snocross Championship title, Tucker has been selected as one of 32 male action sports athletes to be included in X Games’ “Best in Action Sports” online bracket competition. Starting today, you can cast your vote to crown the top current action sports star. In the opening round, Hibbert is up against pro skier Seth Morrison. You have until March 24 to push Tucker to the next round! The final stop of the ISOC Naitonal Snocross tour will take place March 15-17 in Lake Geneva, Wisc. For the first time in history, Grand Geneva Resort’s ski hill host Pro Open racing under the lights Friday and Saturday nights. 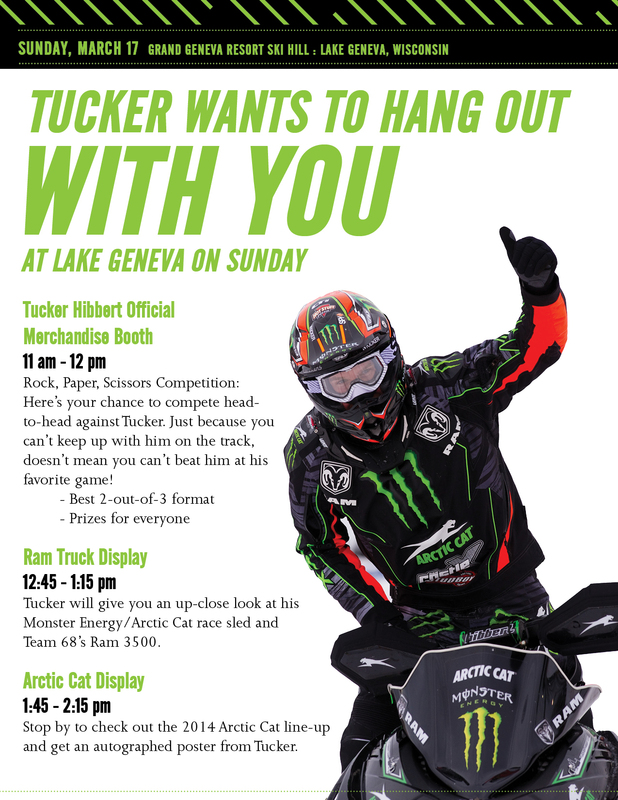 Tucker will not be racing Sunday, March 17 but will be on-site all day interacting with his fans. Sunday, March 17: Schedule listed in image below.